The last news about the movie Saw 7 aka Saw 3D. 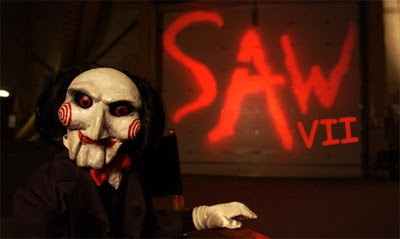 Watch the trailer of Saw VII. 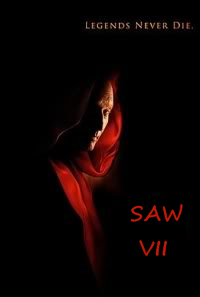 We knew already that there would be a Saw 7 movie, Actor Tobin Bell confirmed indeed that he'll be back at least till Saw 8. Well it's good to be reassured even more and to know that Scriptwriters Marcus Dunstan and Patrick Melton have signed on to pen the seventh installment in the Saw movie franchise. Depending on the success of Saw VI, Editor-turned-Director Kevin Greutert is likely to direct Saw VII. But Scriptwriter Marcus Dunstan, who made his directorial debut this year with The Collector, could compete for the job. I suppose it's not so fartfetched either to imagine the two guys co-directing the upcoming Saw VII movie: because they're both expert for all things Saw, I think they could deliver the best Saw movie ever together. Regarding the release date of Saw 7: nothing official yet, but we can fairly bet that Lionsgate will respect the tradition and will release Saw 7 in October 2010. Well no real clue yet about the plot of Saw 7. But legends never really die, and Jigsaw's work won't be stopped. This new Saw sequel will for sure deliver as many tricky and twisted traps as the previous Saw movies did. Any suggestion to Marcus Dunstan Patrick Melton for the movie Saw 7?